We focus on the whole family, from infants to seniors, and all the stages in between. Providing patients with continuity of care is the hallmark and primary objective of our family medicine practice. This helps us foster your confidence and enables us to be more effective advocates on your behalf. Benefits for patients include early recognition of healthcare problems, convenience and comfort in having all family member doctors in one place and long-term familiarity of your health history. In addition, we serve as a central resource for advice and referrals for other healthcare services. And when necessary it provides us easy access to the records of other family members so we can make more informed medical decisions when we’re dealing with allergies, inherited traits and other conditions. Electronic Medical Records, or EMR, is an information sharing system for both patients and doctors. It gives your doctor valuable access to all data on prior medical history, prescriptions, lab results– the information we need to effectively treat you as a patient. It’s all neatly stored in one easy to access database record. Because all the information we need is at our fingertips you get a more informed diagnosis. Faster and more efficient diagnosis and treatments. Contact us to find out more about services or to make an appointment. 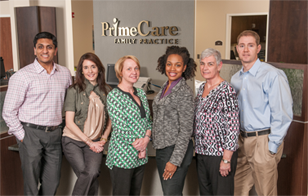 Prime Care Family Practice is NCQA Level 3 certified. NCQA is an independent, not-for-profit organization dedicated to assessing and reporting on the quality of managed care plans, managed behavioral healthcare organizations, preferred provider organizations, new health plans, physician organizations, credentials verification organizations, disease management programs and other health-related programs.